Traditionally, in grammar – translation classroom, learners typically spent years and yet many of them still unable to use the language effectively so that a new approach to language learning and teaching was needed. The author believes that language learning should have a central place in any educational system. However, we need to learn language as communication, not just as a list of fact to be memorized or a set of symbols to be manipulated. Effective foreign language learning produces learners with the social and cognitive problem-solving skills that can be used in other subjects in the school curriculum. In general education, Stenhouse (1975) changed perspectives with a compelling rationale for the elevation of process (traditionally the domain of methodology) to the same status as content. Mike Breen (1984) and Leo Van Lier (1988). These developments are described in some detail in my 1989 book on syllabus design. Traditionally, Mike Breen (1984) argued, content was seen as destination. Separation became difficult to sustain because, if our method of achieving the target performance is to rehearse that performance in class then the route becomes destination. Syllabus designers begin by choosing language content and learning experiences that match the needs of learners as users of language beyond on classroom. In designing courses they are guided by specified communicative tasks that learners can perform at the end of their learning. In consequence, it is easier for learners to apply what they have learned in class to the challenge of communicating in the real world and for employers to know what learners can do. In practical terms, syllabus designers no longer begin with a structurally graded list of linguistic items, and then cast around for ways of teaching those items. In traditional language classroom, learners are thought chiefly about language and its rules. They learn facts about language rather than how to use it communicatively to express ideas to talk and write to other people, to read and listen to real language and to learn how to cooperate with others. High-structure teaching situations are those in which the teacher is very much in control of the instructional process. In those situations, learners have relatively little power or control over either the content or process of learning. Low-structure situations, on the other hand provide learners with numerous options and a great deal of autonomy. According to Biggs and Telfer (1987 : 362) all instructional decision making can be located on a continuum which has "high-structure" decisions at one extreme and "low-structure" decisions at the other. As indicated in the preceding section, learners in classroom characterized by a transmission model of learning are cast in a relative passive role. They are passenger being carried forward in learning experience by the teacher. In language classroom operating within such a transmission mode, learners practice patterns provided by teachers, textbook, and tapes. The following task, adapted from a recent textbook is an example of a task that is purportedly a communicative exercise, but is in reality a reproductive exercise practicing comparative adjectives. Creative language use involves the recombination of similar elements (words, structure, and prefabricated patterns) in new ways to produce utterances that have never been produced before by that particular individual (for that individual, they are therefore unique). In role plays, stimulation, and problem solving tasks, learners are given opportunities for creative language use. Grammar-translation and audiolingualism adopted very different approaches to the treatment of grammar. In fact, audiolingalism developed partly in reaction to grammar-translation excessively approach to the teaching of grammar. Language learning is a process of habit formation. Teachers should teach the language, they should not teach about the language. In the teaching methodology that reflects what we know about second language acquisition, grammar and vocabulary are thought communicatively. Grammatical patterns are matched to particular communicative meanings so that learners can see the connection between form and function. Learners learn how to choose the right pattern to express the ideas and feelings that they want to express. They learn how to use grammar to express different communicative meanings. Authentic texts are those that have been produced in the course of genuine communication, not specially written for purpose of language teaching. They provide learners with opportunities to experience language as it is used beyond the classroom. Of course there is great deal of language generated within the classroom itself that is authentic and can very often be used for pedagogical purpose. With appropriate guidance and support even low level learners can benefit from opportunities to work with everyday spoken and written texts such as these. Older learners can be given a greater sense of ownership and control over their own learning by being encouraged to bring their own authentic data the classroom. In contemporary approaches to language teaching the design of textbooks has become much more sophisticated. The incorporation of real and authentic data brings the content to life and helps learners make connections between the classroom world and the world beyond it. In addition classroom text published textbook series these days typically contain self-study workbooks, cassette tapes, and videotaped materials that bring the real world into the classroom. Increasingly access to the internet also brings the world into the classroom. Student can access and even download a wide rang of informative, educational, and entertaining information. They can also establish contact with other first and second speakers of English around the world through chat lines and pen pal links. In addition to increasing their intercultural awareness and sensitivities this also provides them with opportunities for genuine communication beyond the classroom. Such opportunities are not always easy to find in foreign language settings, and so the explosion in internet usage has been particularly valuable to EFL students. In traditional classroom, learners typically did not learn how to become better language learners on their own once they left a school or college. As a result, students rarely learned how to make use of this stored knowledge in an organized and creative way. Ways of learning language better and more affectively was not on the pedagogical agenda, and practice was therefore often unfocused and not directed at those skills they needed to improve. A substantial amount of research has now been carried out on learning styles and strategies, and, in classrooms where teachers have been able to draw on this research their student is able to develop a range of effective language learning strategies. They learn how to read and listen effectively, how to work well in corporation with others, how to use what they know in new and unpredictable situations, how to speak and write appropriately and so on. As we have seen, the traditional mode of classroom organization was a teacher-fronted one, with learners sitting in rows facing the teacher. The physical set-up of classroom was predicated on this mode of organization, with desks set out in rows and even in many cases screwed to the floor, thus making any other mode of organization almost impossible. In chapter 1, we saw that experiential learning was based on a constructivist approach to education. Such a philosophy is realized at a classroom level by cooperative, task-based learning, with learners working in small groups and pairs. Students become skilled at cooperating with others and express their own opinions, ideas, and feelings, guided by teacher. Group work is essential to any classroom that is based on principles of experiential learning. Through group work, learners develop their ability to communicate through tasks that require them, within the classroom to approximate the kinds of things they will need to be able to do to communicate in the world beyond the classroom. In traditional learning environments, assessment practices are characterized by standardized tests designed, administered and graded by outside authorities. Teachers have little control of what is assessed or how it is assessed and the examination system has a disproportionate influence over the curriculum. In such environments, learners do not develop their own ability to assess how much they have learned and how much they need to learn. As a result they often do not know exactly what they have learned and how much they still have to learn. The assessment is typically through quizzes and test that do not reflect actual language use. In contemporary language teaching learners are trained systematically in ways of assessing their own learning progress. Learners can identify their own strengths better and where they need help from the teacher. When they leave the program we can indicate their proficiency level in the language they have been studying and also provide a profile of their strength and weaknesses in many other factors that influence effective communication. In this way, learners, parents, and employers can see precisely what progress has been made and what communicative tasks learners can successfully carry out. Increasingly, portfolios of work, providing concrete instances of learner achievement are being accepted by employers and educational institutions. In contemporary approaches to language teaching, learners are involved in role plays and practice simulations, and through these develop an ability to carry out creative and imaginative learning projects outside of the language classroom. These projects are carefully connected to the kinds of language tasks that they will have to perform when they complete their studies. In this way they develop independence, they learn how to function as communicators themselves and they learn to use language as a working tool to achieve their objective outside if the classroom. In this chapter, I have drawn together the major ideological and empirical themes that emerged in the first two chapters. 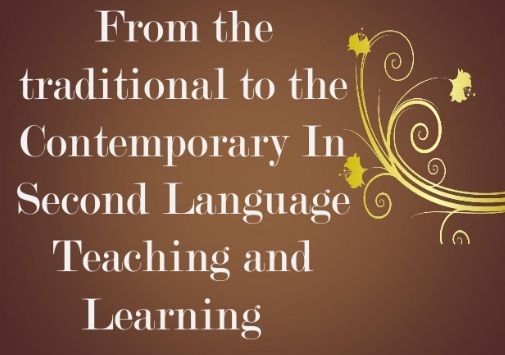 I have illustrated the change that have been brought about to pedagogical practice as a result of changing views on the nature of language and learning and also through the incorporation into classroom teaching of insights from research. What is grammar-translation and audiolingualism? Grammar-translation is teaching grammar by using translation. Could you explain about the statement “teachers should teach the language, they should not teach about the language”? How to develop the small village from the Traditional to the Contemporary in Second Language Teaching and Learning? We can use some techniques related to contemporary style that is appropriate and possible to be applied at villages. If we can't use Internet in the villages so we just don't use it. Which one is the most important between structure of language and the language? Both of them are important. We teach the second language as the means of communication, but without the appropriate ability in structuring the language it will be hard to be understood. Usually, the language comes at the first time, then we're studying about it's structure. What is the major of conceptual based on Stenhouse? Studying about the content as the aim and methodology is the way. What are the differences between High-structure versus low-structure teaching? In high-structure, teacher dominates the classroom, and in low-structure, students dominate in the classroom (students centered). What are the differences between assessment and evaluation? If evaluation deals with the collection and interpretation of information about aspects of the curriculum (including learners, teachers, material, learning arrangement) for decision making purposes, then assessment is the subcomponent of evaluation. What does the means by student self-assessment? It means that the students are trained systematically in ways of assessing their own progress.